So we headed up the mountain- literally- to Brevard, North Carolina. Home of the White Squirrel Festival, Brevard is a charming little town with an equally charming Main Street. And I’m happy to report, several charming little shops to explore…shall we? I’m like a heat-seeking missile when it comes to architectural salvage…ESPECIALLY when the shop is well-organized…and EVEN MORE ESPECIALLY when the goodies are affordably priced (or at least not outrageous). So, a huge round of applause to Underground Salvage Company- seriously fantastic shop full of amazing pieces at comfortable prices. Can’t wait to go back! Located at 84 E. Main Street, and with an area of pets available for adoption (kitties! ), this is my kind of place! It looks small at first, but don’t be dismayed- there’s a basement that is chock-full of treasures to be found. I had exceptional luck with their selection of vintage linens, and interestingly enough, classic wooden puzzles! 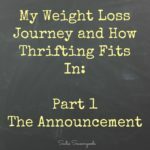 If animal-based thrift shops are my favorite kind, then domestic violence prevention-based thrift shops are a close second- making Safe’s Attic an obvious stop on my junkin’ journey! It was BIG and FULL of all kinds of fun stuff- including shower shelves, which had been on my “project needs” list for a while. I came away with a decent haul from this store, and felt awfully good about it! It’s like Project Central here! Hmmm…what could I possibly do with these? If you’re looking for American primitives while in Brevard, NC, then Shabby Shack needs to be at the top of your list. It’s an antiques mall with a little bit of everything, but with a higher percentage of rustic, primitive pieces. So, obviously, I was smitten…just the jumble of goodies outside the front door gave me heart palpitations (in a good way). Definitely a welcoming site…see anything you like? Happy Birthday from Mr. Seasongoods! ANOTHER PET CHARITY SHOP!! Yes…I was very excited to find this place. It’s cute, tucked away, and definitely worth a visit- especially for housewares and other smalls. Truly a treasure trove for upcycling projects waiting to happen! Quaint and absolutely filled with possibilities…my kind of place! Last, but not least, The Shop of St. Philips- it’s located next door to Friends for Life, so this is a double-bonus for us thrifters- Park once, shop twice! Even though I wasn’t looking for clothing, this shop seemed to have an excellent selection…but I stuck to the perimeter, looking at housewares, linens…and then I found their crafty-bit room! I couldn’t pass up this Lazy Susan- it’s so gorgeous! And I promise I won’t paint over it at all. While we were there, we had a lovely lunch at The Square Root– fried zucchini strips and sweet potato chips as side options?? Sign me up! Oh…and straight across the alley from lunch? Brevard’s very only chocolatier- Downtown Chocolates. Moral of the story- we ate our weight in Brevard. So, where to next? I’m always looking for suggestions- especially in the Southeast and Mid-Atlantic region! Thanks for the fabulous finds! I’m not too far from Brevard, so I’ll be planning a trip over that way myself. If you haven’t already – I’m a relatively new follower – you might check out Black Mountain – there are a wealth of shops there – a mix of antique, thrift and specialty. Great restaurants too. Head a little further east to Old Fort and Marion. The shops are a bit more spread out, but some nice finds there as well. Happy hunting! I definitely need to check out Black Mountain!! Hmmmm…maybe that’s where I’ll head to next. 🙂 Thank you so much!! You’re so very welcome! I work in the tourism office in the county to the east, so if you head my way, let me know. I’m happy to answer any questions if I can. Happy Trails! yum! yum! gimme sum!! lol I love it! Looks like a fabulous day! I think you’ve tempted me into taking a day trip this weekend.Thanks for sharing all of the good spots! We visited Brevard based on a motel recommendation I saw online. Counting the days till I get to go back. Nice!!! It’s seriously a great town. Have not been to Brevard for years. Makes me yearn for a junk trip there. Still waiting to meet you in Ridge Spring. I know!! We need to find an open Saturday in March or April. There are some great shops there! There is an architectural salvage place in a town called Aurora near me in Oregon and it is also filled with lots of antique stores! I would love to visit those shops! It is definitely a fun place to visit! Thank you for taking me along on the junkin trip and for sharing at Vintage Charm. I’m putting Brevard on my list of junkin destinations. These places look like fantastic junkin trip destinations. Wish we had more in our area to visit! Thank you for sharing your day with us at Snickerdoodle Sunday!